Jan 22, 2019 – PreHeat is here; and so is the cold! I’m not flying today. I have a sim session starting this morning at 11am, and that won’t leave me enough time to do a daylight flight and put the airplane away without rushing. I’m still limiting myself to day VFR until I get all the planned test flights in. It’s 15 degrees outside, and I’d love to try out the pre-heated experience this morning, but I actually have to work today. Bummer. The next opportunity to fly will be Thursday through Sunday. I’m thinking there has got to be better weather in there somewhere. Pre-Heat is here! I invested in a pre-heat system for my airplane after a bit of research. In for a penny, in for a pound. I ordered a cabin heater at the same time. Historically, my flight hours have dropped off in and around February when it gets bitter cold. Rather than have more equipment to maintain, I just limited my engine starts to temperatures above 20 degrees. Flying in February, unless I was headed to Florida for an adventure, just wasn’t worth all the hassle. This year, I decided to fly through the winter since the airplane has been unavailable for so long. I really want to fly it, and don’t want to wait for March. Besides, I need to get the 15 hours in to be able to close the project with Matt. I’m as anxious to close that project as he is. On top of all that, there is work to get done on the airplane for the IFR cert up in Lancaster, and then the paint repair in the same area. I’ll be flying in the cold if I want all this done. Continuing to fly through winter will ensure I have a sound airplane by the time warm weather gets here and I’m ready to travel. Decision made – I began my research. I ended up on aircraftheaters.com. 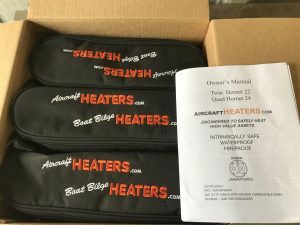 The heaters I chose are deigned for aircraft, and may be used where fuel is present. They provide low level consistent heat from the top of the engine down. These heaters need to be placed into the engine inlets and laid on top of the engines just behind the propellers. That was my first concern – I couldn’t see how there was much room for anything in there since I have the LoPresti Wow Cowls on my airplane. Those cowls are pretty tight, meaning I had serious doubts about the ability to just slide then in and expect them to fit. I called the company and spoke with one of the designers about my concerns. I told him about the after market cowls. He understood but was confident that they’d fit. He suggested that I build a cardboard mockup and actually go try it to see for myself. I built up a 2″ by 2″ by 9″ cardboard mockup and headed over to the hangar. I’ll be damned! 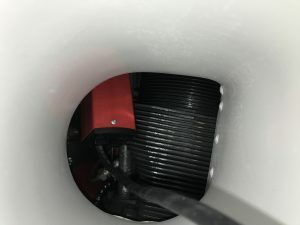 They slid right in there and I could move the block around and lay it on top of the cylinders inside of the baffled area. At least the mockup could be easily inserted, and with a bit of finagling, I could lay them right behind the props. I spoke with Bryan Knowlton ([email protected]) at aircraftheaters.com. You can his video that explains the product on YouTube, and learn what I did. The installed heater went in more easily than the mockup, actually. In the picture at right I had just put it in to see how much room I had. The final position was to rotate to the right and lay it up and behind the prop. I had planned to have Beverly make me two custom nacelle covers when I couldn’t find them for sale. i discussed this with Bryan and he told me that testing was done using two moving blankets from Harbor Freight that were $5 apiece. Beverly was ready to start, but the girl is busy. I purchased two of the larger blankets at $9 apiece for each side, and for a total of $36 bucks I had the insulation I needed. The cabin heater unit is a small block with a fan in the back and exhaust out the front. 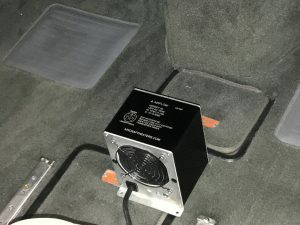 You can see here that I placed it between the front seats in a way that the heat exhaust will flow toward the firewall and up behind the instrument panel. The cabin would then warm from the panel on back. 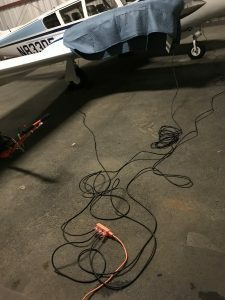 Each unit each comes with 40′ heavy duty cord that can reach either side of the hangar. For the cabin heater, I routed the cord between the front and back seats, and then out the baggage door. That door has an airshock, so it will hold itself closed (for the most part) without crushing the cord. Nice fit!. My outlets are near the entrance door. The cabin heater cord drops out the baggage door on the pilot’s side rear and then comes under the wing and over towards the outlet. The nacelle heaters have plenty of cord to bring then directly to the same outlet. I just added a 3 position short heavy duty extension cord for convenience. Each of the plugs lights up to verify power to the heaters. I opted not to test their thermostats, and just plugged them in. You could hear the fans from all three units right away, and feel the warmth from the cabin heater immediately. My plan is to leave them plugged in all winter. It will take a few days to stabilize the temps from the cold soaked state they are in now, but once I’m there I’ll be good. Bryan and I talked about putting the heaters in right after a flight, and he assured me that the units can take the heat. His only guidance was to put the heaters in as the last thing you do. I tested this theory before I ordered them actually, and found I could put my arm in there by the time I had the airplane stowed in the hangar. This could actually work. Testing: The only testing I’ve done so far is non-scientific. I visited the hangar about 5 times to verify I wasn’t burning the place down or peeling paint off my nacelles. The tops of the nacelles are warm to the touch and the tops of the cylinders are warm too. 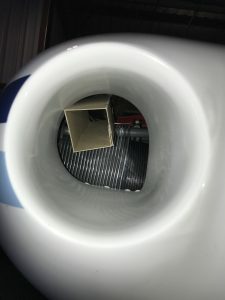 The nacelle bottoms are very cool, so you can’t tell what is happening down there. I turned on the master switch to see what the oil temps would say as an alternative way to evaluate. It was 18 degrees the last time I checked the heaters, and the oil temp gauges indicated in on the low end of the green. The fact that they indicated at all tells me the oil is being warmed up. The indications I observed are generally what you see when you reach the hold short line on a cold start day. It appears that these heaters are working. As for the cabin heater, I should have done this a long time ago. I know I only have one vacuum instrument left and it is for the autopilot. Still – I believe that a constant temperature in my cabin will extend my avionics life and make things work better. It also makes the cabin warm from the start. I’ll make an update when I do my first cold morning operation later this week.